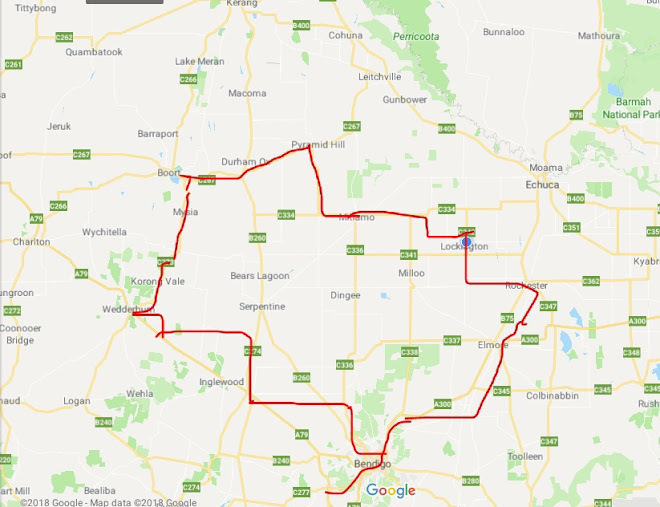 It was a tough day this morning - for days now the Elders website said today would be a south south westerly which would be a cross tailwind for us today but alas as our luck would go we had a south south easterly a cross headwind and a strong one at that. We were the only ones in the Quambatook caravan park so it was very peaceful. 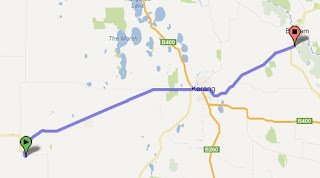 We left early this morning and headed east to Kerang, the first 20km was okay but the last 20km to Kerang the wind really picked up and was blowing from our right so whenever a truck went past we would wobble all over the place or stop dead from the wind draft if it was going in the opposite direction to us! I thought this road would be busy with local traffic but I was surprised just how much truck traffic there was and not much car traffic. As per usual Neil had his hawk eyes looking for road kill and he fortunately found yet another 8mm shifter ... find #1 and probably 8mm shifter #5! Early in the morning we came across a blue tongue lizard sunning itself on the side of the road. Haven't seen too many lizards on this trip. Got to Kerang about 11am and it is a big enough town that it has a woolies so we picked up food and had a cuppa there. 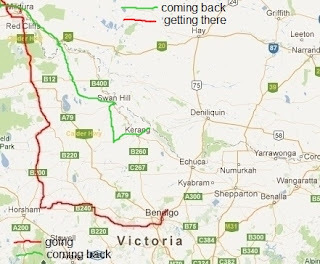 We then continued east towards the Murray River again. This road is flat and in open country and you start to see large fields divided into sections for irrigation and they are a green as grass (!) this is where there is alot of open channel country - all for paddocks for fodder for milking cattle. Not far out of Kerang Neil found a very good rear bike light - find #2 for today. We got to Koondrook a little later than what I had expected, at around 2pm. Just in time for a cuppa so I go to the camp kitchen and was walking back with my pot full of hot water and looking at the ground passing the bbq and I saw 2 little round discs and quickly realised what it was, momentarily forgetting that I had a pot full of hot water I quickly bent down to get them and nearly poured the hot water all over my feet ... woo hoo it was 2 $2 coins .... winner! this trip is definitely different compared to the others as Neil always finds the money and I find the 5 cent pieces whereas this trip I have found $6 so far and Neil has found 5 cents!!! The campground is quite, has alot of permanent holiday shacks as it is on the gunbower river which flows into the murray river about 50m from here - so a popular little spot. We have a lovely shaded spot. Tomorrow we are off to Pyramid Hill - never been there before but been on part of the roads that we are taking to get there.